Leasing companies receive and produce thousands of documents each day in order to process and support equipment finance transactions. The time and effort that it takes to process these documents can have significant bottom-line impacts. Even companies that have implemented portals and/or document workflows in their origination and booking process struggle with having to re-key information and sometimes even have to print electronic copies in order to do so. When implemented properly, Optical Character Recognition (OCR) software can reduce the need to re-print and re-key data, or even key the data in the first place! Imagine your company had the ability to search through thousands of documents via keyword searches in a fraction of the time it takes to manually sort existing paperwork. 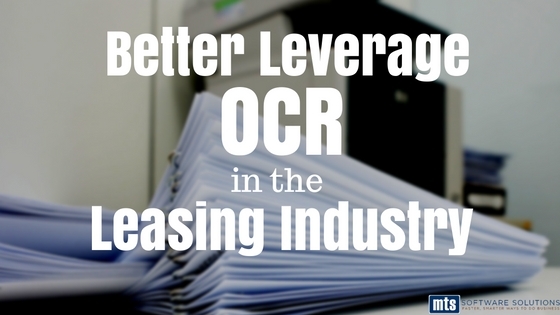 Lease finance organizations can leverage OCR to gain full control over their documents and lower the costs of their operations in order to focus on more valuable tasks. Optical Character Recognition, or OCR, is a technology that enables organizations to convert different types of documents, such as scanned paper documents, PDF files or even digital photographs into editable and searchable data. For example, if a vendor has emailed you a scanned lease application as a .pdf attachment, you have nothing more than a collection of dots, known as a raster image. In order to extract and access the data digitally, you need OCR software to single out letters within the image, put them into words, words into sentences, etc. thus enabling you to use the data within the image. OCR technology has been used successfully in numerous industries to increase efficiency for decades, including in the financial services industry. For example, banks have employed the use of OCR in their check scanner solutions. OCR technology is used to capture data from scanned images of print and handwritten checks, effectively reducing lines and wait times. Yet, the technology remains underutilized in the equipment finance industry – and at a great cost to lessors and lessees alike. This technology has matured significantly increasing accuracy while also becoming more affordable. It is readily available for businesses of all types and sizes who want to take full advantage of the benefits of OCR and achieve a return on their investment in the technology. Visit our exhibit at the 2016 ELFA Operations & Technology Conference! Below are seven ways that lease finance organizations can benefit from implementing advanced OCR technology. 1. Make information within every document searchable. Looking for documentation related to a particular vendor? Know that it’s somewhere in this file folder or that filing cabinet? Without OCR, you might be spending a while trying to find it. With OCR, you can easily and accurately convert documents into formats you can search. For example, you can access customer, vendor, and/or invoice data (and more) without having to pore over paper or digital documents looking for the information. 2. Extract and integrate content faster. OCR technology has come a long way. With advanced OCR technology, you can automatically extract data points from documents. You can then compare that data to other systems or ingest that data into other systems without anyone even touching it! 3. Share documents while keeping information secure. With OCR technology, you can easily and even automatically redact sensitive information so that you can share your documents internally or externally without the risk of that sensitive data getting in the wrong hands. 4. Reduce paper and the need to re-print documents. OCR offers the ability to search within documents and easily locate the documents and the data you need to keep transactions moving towards close. Therefore, you can reduce the need for multiple parties to print, scan, re-print, and re-scan at various steps within the lease life-cycle. Without having to re-key information into multiple systems by multiple people, everything happens faster. This means quicker processing of credit applications for credit review, quicker turn-around times, faster and effortless creation of assets in your portfolio, and more. With all of that time and effort you’re saving from being able to search within documents and not having to manual process the documents and data, you’re also saving money! The reduced overhead translates into higher profits, more business, and happier customers. As you can see, OCR technology is about much more than just saving paper. It can dramatically improve your operations. Document imaging with OCR guarantees data that is organized, accurate, and easily retrievable – streamlining their workflow and improving service. 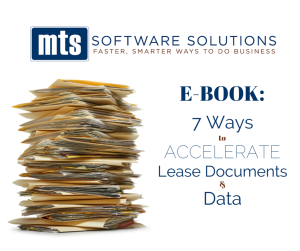 With the advanced capture and OCR products offered by MTS Software Solutions, your leasing organization can significantly speed the process of managing, preparing, reviewing and producing finance documents.